Featuring a zoom magnification of 7.5X and a long working distance of 115mm, Nikon SMZ745 microscopes are well suited for both industrial and biomedical applications. The adoption of a new total reflection prism produces brighter images with higher contrast, and the anti-mold design allows the microscope to be used in environments where the temperature and humidity are high. 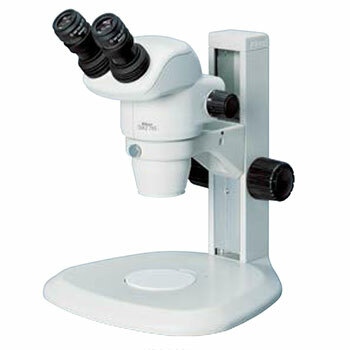 The SMZ-745T trinocular model comes equipped with a microscope camera port and a built-in 0.55x c-mount adapter.